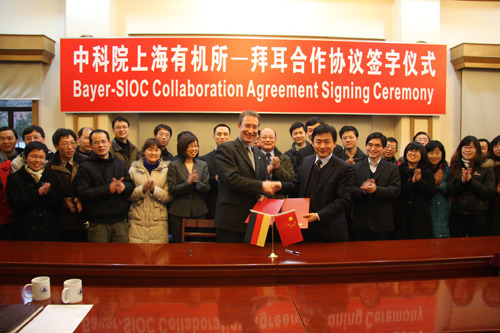 On March 3, 2010, the Signing Ceremony of the Bayer-SIOC Collaboration Agreement was held at the Shanghai Institute of Organic Chemistry, CAS. Prof. Dr. Hanno Wild, Senior Vice President of Global Lead Generation and Optimization, Global Drug Discovery, Bayer Schering Pharma, Dr. Xin Ma, Head of Global Drug Discovery, Innovation Center China, Bayer Schering Pharma, Dr. Will Liu, Director of Innovation Management, Innovation Center China, Bayer Schering Pharma, Prof. Dr. Kuiling Ding, Director of Shanghai Institute of Organic Chemistry, CAS, Dr. Xiaolong Zhao, Deputy Head of Section of Project Management of SIOC, and around 25 SIOC-BSP Collaboration scientific staff including Prof. Weimin Fu, SIOC Collaboration Manager and Prof. Dr. Ran Hong, SIOC Collaboration Expert attended the ceremony. 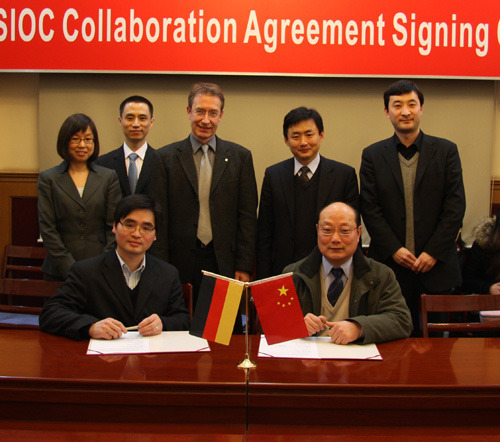 At the ceremony hosted by Prof. Weimin Fu, Prof. Dr. Hanno Wild and Prof. Dr. Kuiling Ding signed the agreement as representatives of Bayer Schering Pharma (BSP) and SIOC, and made a welcome address, respectively. 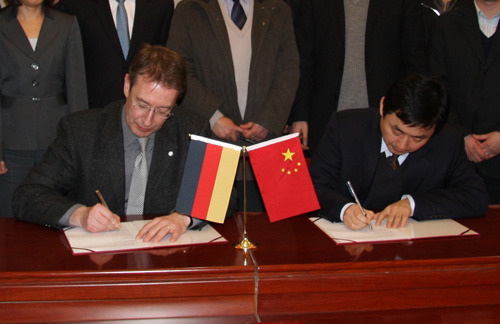 Dr. Christoph Huwe, BSP Collaboration Manager, and Dr. Jens Ackerstaff, BSP Collaboration Expert, signed the agreement in Germany late. During their speeches, both of Prof. Wild and Prof. Ding praised the fruitful collaboration between BSP and SIOC, and the research achievements that have been gained in the course of the collaboration over the past 14 years. Meanwhile, they expressed their strong confidence and prospects for the next collaboration period, not only promoting close cooperation in Medicinal Chemistry, but also in other research areas, such as Organofluorine Chemistry and Organometallic Chemistry. The collaboration between the Shanghai Institute of Organic Chemistry and Bayer Schering Pharma was established as early as 1996. The initial setup of this collaboration (in the beginning with Berlex Biosciences, a Schering AG subsidiary) focused mainly on the synthesis of large numbers of template families and scaffold analogs. Later, the focus was shifted towards an increased variety of molecular structures, more complex syntheses, a growing share of single compounds and small scaffold series, and expanded towards synthesis of intermediates and final compounds. Around 100 SIOC scientific staff including more than ten professors or principle investigators were involved in the collaboration over the past 14 years.